Th-INK-ing of You: Pockets full of love! Hello friends! I hope you are warm and dry where you are! We are bracing for a storm here in the Carolinas, and this time it sounds like it could be a doozie! I wanted to share a fun card I made for my Granddaughter for Valentines Day. It has 2 fun pockets! I added tags that tuck into the pockets and attached them inside the pockets with twine and tape. The pretty designer paper is from this month's release at Our Daily Bread designs, and is called the Heart and Soul Paper Collection. 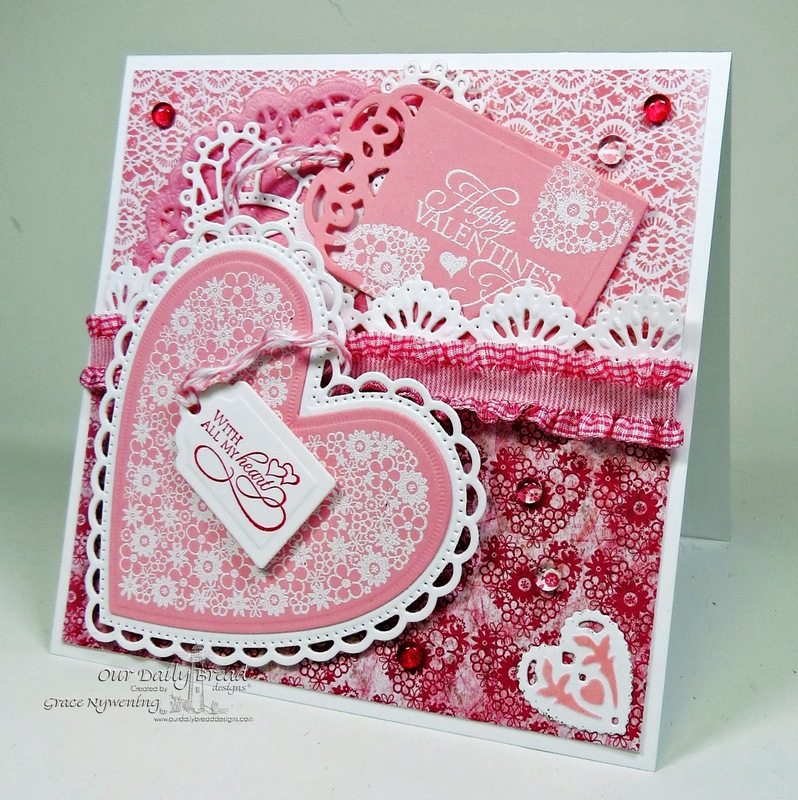 For the images, I stamped the fun floral heart from Clean Heart on pink card stock with white craft ink, and then heat embossed with white embossing powder. I cut it out with the second largest heart die from the ODBD Custom Ornate Heart Die Set, and then cut the largest heart out of white card stock to mat it on. I did the same with the pink tag, stamping my sentiment from Bless Your Heart, and parts of the small heart from Clean Heart, and then cutting with the largest tag from the ODBD Custom Recipe Card and Tag Die. The small tag is stamped wtih Rose Red ink and cut with the small tag from the ODBD Custom Recipe Card and Tags Die Set. The paper lace edging of the lower pocket is cut from the Beautiful Borders Dies, also released this month. I added a stenciled heart from the Ornate Heart Dies in the lower corner, some page pebbles and some ribbon to finish off the card. Thanks so much for stopping by!!! If you live on the east coast of the US.... stay warm and safe these next few days!!! I'm hoping not to have to go out at all! Maybe that means more stamping time? We'll see! Oh how gorgeous Grace!! I just love the pocket design, all the pink and your added tag!! I love every detail sweet friend!! beautiful, love all the lacey feel of the card, and such pretty trim! This card brightens my day! You always do such wonderful items and I know she will love it. I am keeping you in my prayers as this latest storm comes up. I am not expecting much from this one but keeping an eye on the weather forecast. Oh, Grace, what a gorgeous card! I always love your designs, and this picket card is amazing with such rich color! I just love how you've used all the wonderful new dies and stamps...and the tag! Just makes me smile and will surely. Make your precious sigh at its beauty...for her grandma! Hugs, sweet friend! Stunning card Grace. I think your grand daughter will love it. This is gorgeous Grace. Love the design. Grace this is gorgeous - your grand daughter will have felt so blessed and special receiving this. A Sneaky Peek and some Hopes for Spring! Love You Bunches with a Twist! Welcome to the ODBD Feb. release!